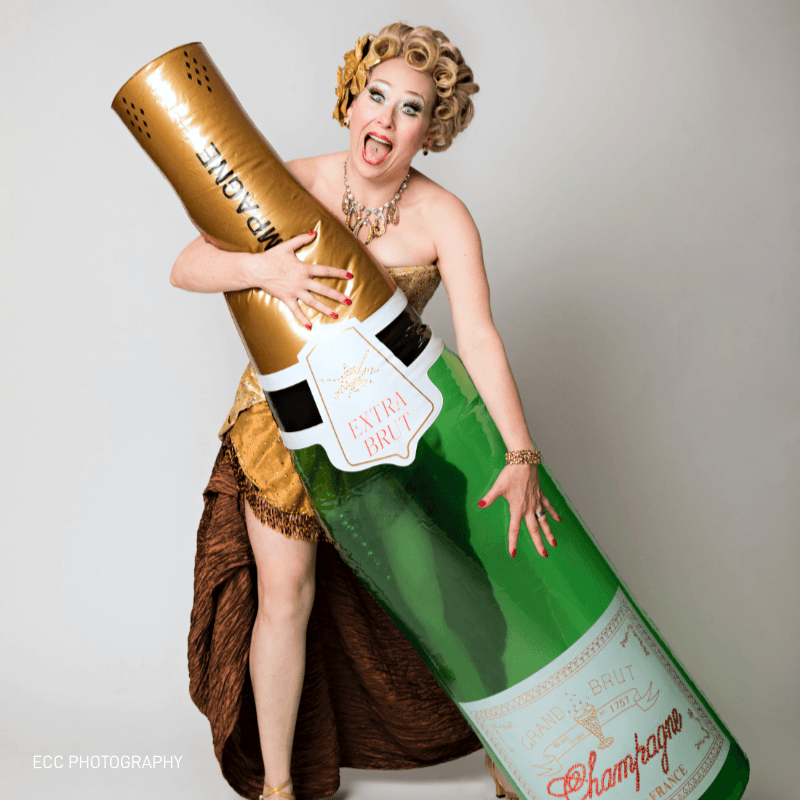 Champagne Sparkles – Effervescent Burlesque Comedienne! Champagne Sparkles has toured throughout Canada, US, and Europe, and she has performed, featured and headlined in multiple festivals. 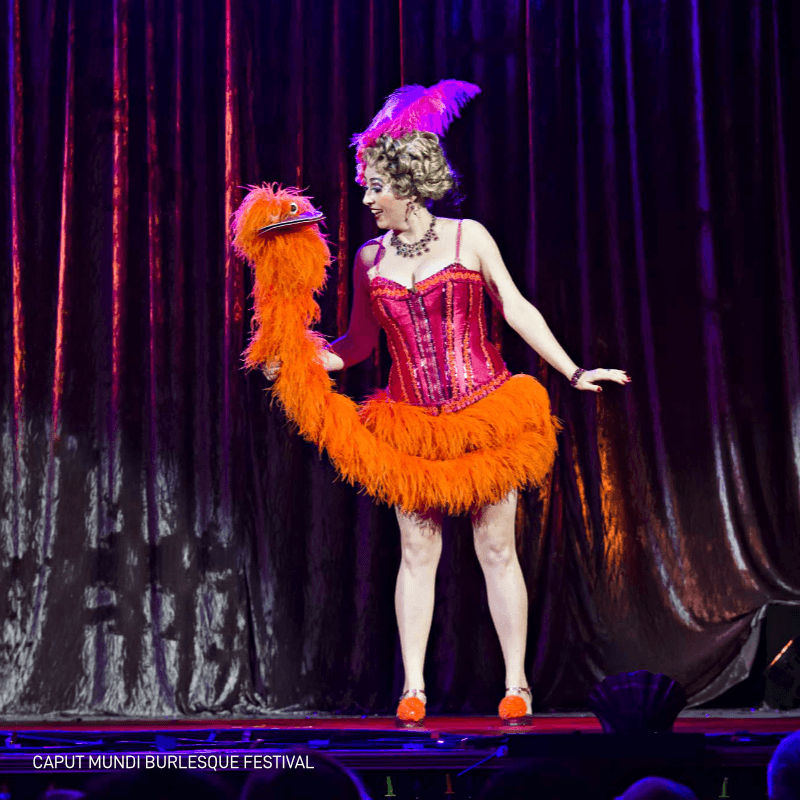 Festival highlights have included performing at the Burlesque Hall of Fame Weekend, as well as Vancouver, Itty Bitty, Stockholm, Rome, Paris, Helsinki, Montreal, Toronto, Edmonton, Calgary, New York, and New Orleans Burlesque Festivals. 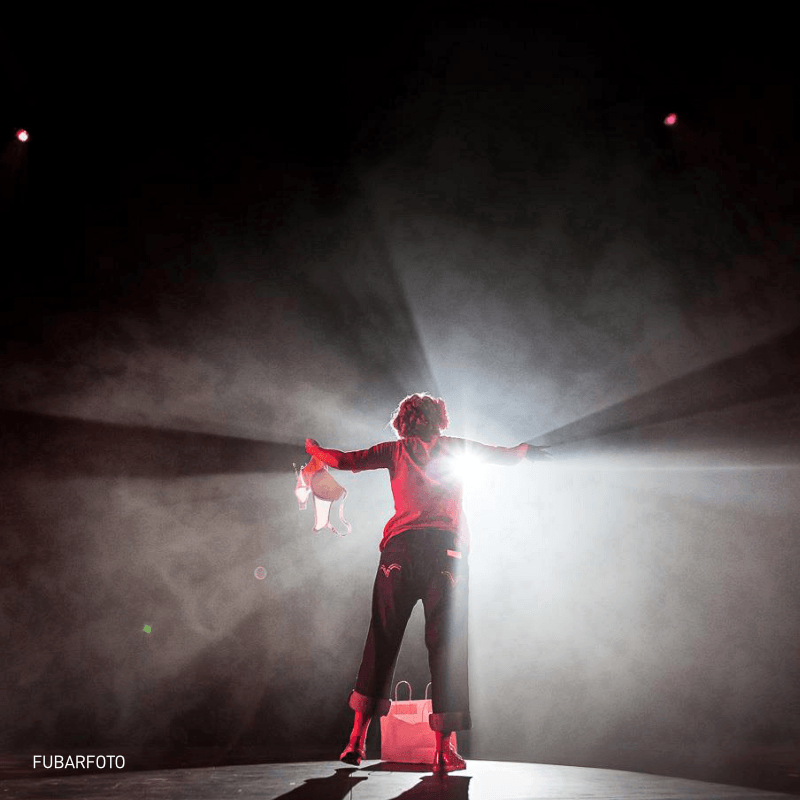 Since 2006, Champagne has been co-founder and a key performer with the award winning Cheesecake Burlesque Revue, western Canada’s premier touring burlesque troupe. 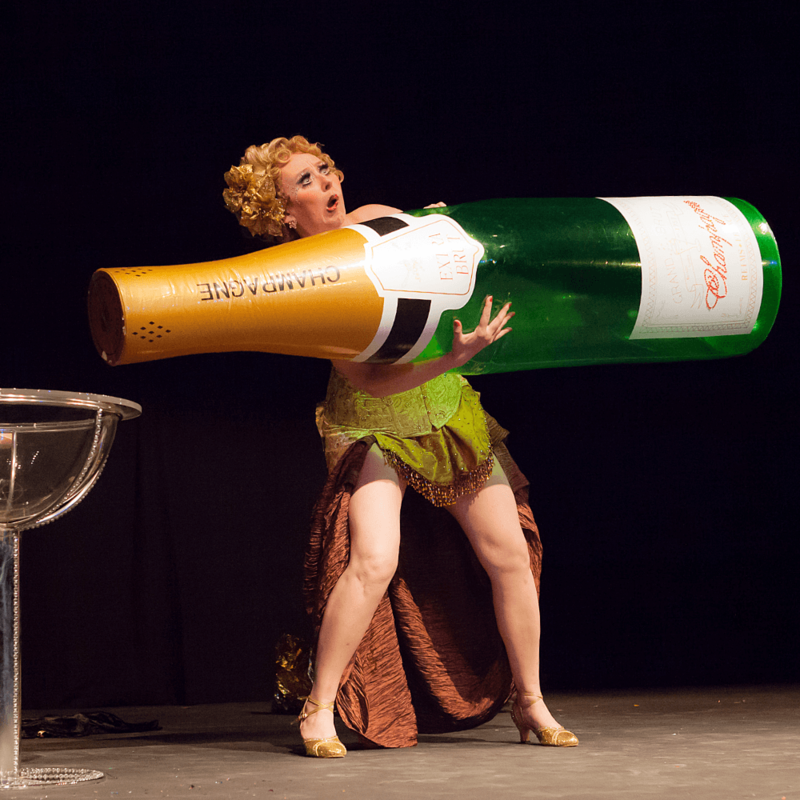 Champagne has produced multiple shows in Canada and Berlin, including producing and touring with the Cheesecakes, and is co-founder of the Isle of Tease Burlesque Festival in Victoria, BC. Champagne is also a burlesque educator and loves sharing her knowledge, connecting people, and helping new performers and producers to succeed! The bride and her buddies will learn how to bump, grind, shimmy & shake with Champagne! Feather boas, gloves, and pasties provided for a fun-filled lesson and great celebration of femininity! What is the story you want to tell the audience? Learn techniques for act and character development, and practice presenting them in a short and easy choreography. Be your own booking agent! So you’ve got some great acts? What’s next? How do you to get yourself booked regularly? In this class you’ll learn about the business side of Show Business! Puttin’ On The Glitz! How To Produce A Show! You’ve got an idea for a show that you’d like to bring to life! How do you make it happen? Producing is a juggling act – learn how to balance all the elements within your budget! Ready for feedback on your act? Need help getting your act stage-ready? Bring a finished act to polish, or just come with a concept, costume or piece of music – whatever has inspired you to create! Everyone is welcome, from new students to seasoned professionals, as well as solos, duets and groups. I will provide considered, thoughtful feedback that is presented with love, honesty and respect. Let’s take your performance to the next level! Consultation via Skype can also be arranged! Champagne Sparkles has been performing, producing and teaching burlesque internationally for over 12 years. She loves sharing her knowledge, connecting people, and helping performers and producers to succeed! She has taught at Burlycon, as well as conducted workshops and private coaching all over the world! Currently located in Victoria, BC and am ready, able and willing to travel wherever you need some SPARKLE on your stage!!! I am available as a headlining or featured performer for show and festivals, as a walk about entertainer, and to teach, including bachelorette parties, workshops, and private coaching.